Last night, Tuesday, December 13, 2016, Hyperion Brewing Company officially became the second brewery to receive approval to open on Main Street in the Springfield National Historic District. With a Jacksonville city counsel vote consisting of 18 yeas and one nay, the brewery helmed by Alexandra McKeown and brewer Troy Orton will open at 1740 Main Street. As I have noted in the past, this is exactly the type of business needed to help revitalize the Main Street Business District and bring other, quality businesses to the area. Time after time other cities have seen breweries bring enormous boosts to areas in need of restoration. And, I am not the only one that says breweries bring gentrification. James Fallows, a freelance writer who, and his wife Deborah spent three years working on a project for The Atlantic that sought to find out what factors lead to the success of American cities following the Recession of 2007-2008. In the article, Fallows created a list of items that indicated a city was bouncing back. The final item on his list is of particular interest to beer-lovers. Fallows was not the only advocate for craft breweries as economic engines for change. An article in USA Today published July 6, 2016 cites multiple examples of how craft breweries improved down-trodden and undesirable neighborhoods. One example cited by the article is the story of how Great Lakes Brewing Company transformed the downtown Ohio City neighborhood of Cleveland, Ohio from a decaying district, “Marred by abandoned buildings and boarded-up stores,” to a thriving market district complete with a renovated market, specialty shops, bars and restaurants. The examples of what a craft brewery can do for a neighborhood are even visible right here in Jacksonville. To provide proof of the benefit craft breweries can have on a neighborhood at a Land Use and Zoning committee meeting, I looked at property values in the Silvertown neighborhood of Jacksonville where Intuition Ale Works maintains a brewery and Bold City Brewing Company has both a brewery and a tap room. The results of my informal and unscientific study showed a staggering 18% increase in property values over the past eight years. It also showed an increase in home renovations and property sales. This is significant because Bold City opened in 2008 — eight years ago — followed by Intuition in 2010. With Main & Six Brewing Company and now Hyperion Brewing Company coming within just a block of each other, Main Street is poised for rapid growth. This growth can only serve to increase property values for long-suffering Springfield residents who, though the neighborhood is growing and attracting younger families and professionals, have longed for a catalyst to spark the rejuvenation of the Main Street shopping district. Only time will tell if the addition of Hyperion and Main & Six breweries will foster more interest in Main Street from other businesses. But, if the examples of other urban neighborhoods holds true, things are definitely looking up. In the meantime, Springfield residents will soon have the benefit of being able to walk to their own local breweries. And that ain’t bad. The Jax Ale Trail, an award winning marketing effort by the fine people at Visit Jacksonville, has just turned one. As a means to put Jacksonville’s burgeoning craft brewing industry in front of potential visitors, it has been an overwhelming success. Consider these numbers as proof of the program; since its inception in December 2014, more than 20,000 people have used their Jax Ale Trail Craft Beer Passports, and almost 900 craft beer enthusiasts from 39 states and five countries have completed their Jax Ale Trail Craft Beer Passports. While it is well known that the Jacksonville craft beer scene is made up of a lively and fiercely loyal crowd of followers who embraced the Ale Trail, nearly 30 percent of all completed passports were from out-of-towners. 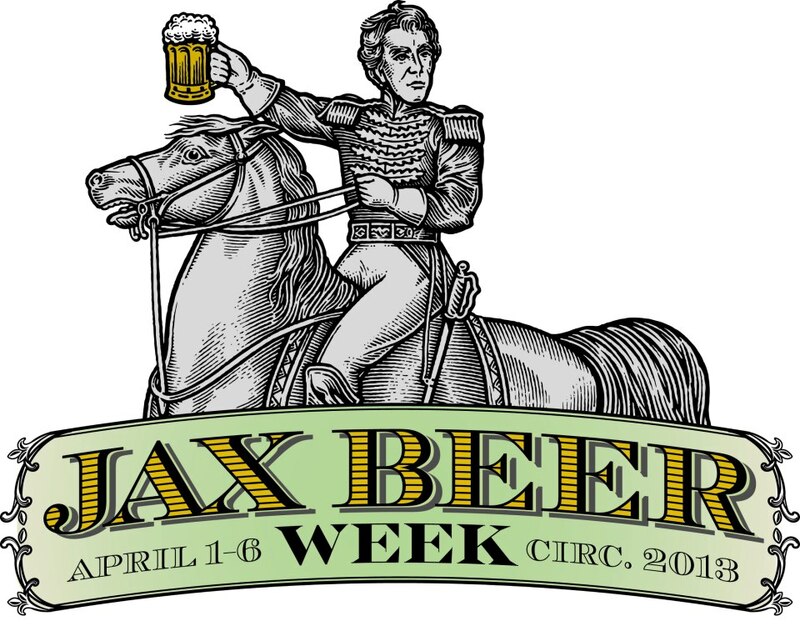 “It is with great pride that we look back at the accomplishments of the Jax Ale Trail in this first year. What started as an idea to showcase our already existing breweries and turn them into a tourism attraction has really taken a life of its own, putting Jacksonville on the national map as an emerging beer destination,” said Katie Mitura, Director of Marketing and Communications for Visit Jacksonville, the city’s tourism marketing organization. “It makes us extra proud to see visitors coming from other cities and countries to drink our great local beer and explore Jacksonville. To add to the accolades heaped on Visit Jacksonville for the Ale Trail, Livability.com just named Jacksonville as one of the top 99 best cities with the best beers in the country. For the inaugural listing, the website was looking for cities that met three criteria: they are good places to live, they are consumers of craft beer and they are producers of the best beer around. Jacksonville fit the bill handily. Coincidentally, last month I was approached by a group of college students who were looking to make a series of documentary films about the Jax Ale Trail. They were looking for a someone to act as host for the programs who had knowledge of the Jacksonville beer scene and of craft beer in general. I was honored to fill the position and had a lot of fun making the four short films they produced. Over the next few days I will post one of their films per day. They range in length from around eight minutes to 13 or so minutes. Some feature interviews with brewers or owners while others simply show off the brewery and their beers. Of the breweries on the Jax Ale Trail Bold City Brewing Company, Green Room Brewing Company, Aardwolf Brewing Company and Engine 15 Brewing Company are featured. The first stop was Bold City Brewing Company. For more information on the Jax Ale Trail visit www.JaxAleTrail.com. As if it were not enough to have Underdark Bourbon Barrel Imperial Stout available on tap and for sale this Saturday, February 1, Intuition Ale Works has just released a guest beer list that is in and of itself astounding. The list has beers from such luminous breweries as Funky Buddha, Founders, Bell’s and even Rodenbach. Underdark is Intuition’s annual release beer and, in its short history, it has garnered a rabid following. The beer began as an amped up version of the brewery’s King Street Imperial Stout but, according to brewer Andrew Cattell, has evolved into its own recipe. Once brewed the beer is then aged for a year in a variety of bourbon barrels. But, the artistry on this beer does not end there. The week before it goes on sale, Cattell and the brewery staff carefully drain each barrel and blends them together creating a single, phenomenal flavor profile. The beer is then bottled for the big release party. Like the brewery did for its anniversary party in November, they will close King Street for the party that runs from 12:00 noon to 9:00 p.m. 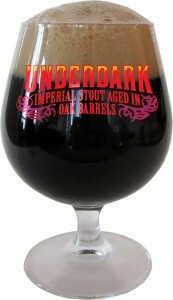 Bottles of Underdark will be available on a first come, first served basis for $15 each. The brewery is also selling vertical two-packs of the brew containing one 2013 and one 2014 bottle. The canned craft beer revolution has really caught on since Oskar Blues rocked the industry by shunning bottles and putting their award-winning brews in aluminum. Just over a year ago, Intuition Ale Works was the first craft brewery in the entire state of Florida to can their tasty brews, now there are many that can including Cigar City and Green Room. The latest local brewery to join the ranks of craft brewers putting beer in tubes, as the Aussies put it, is Bold City. “Dukes Cold Nose Brown Ale has been canned and is our first canned beer. $1 from every case sold will go to support our local Jacksonville Humane Society! “Bold City Dukes Cold Nose Brown Ale Cans will be available tomorrow in select areas/locations including ABC liquors, Total Wine & More, Broudy’s Liquors, Beer:30 and Grassroots Natural Market. Bold City Brewing Company was the first of the craft area craft brewers and has recently begun a major expansion to keep up with growing demand for their products. Future plans include creating an indoor bier garden in what used to be the brewing space of their brewery on Roselle Street in the Riverside/Avondale area of Jacksonville. 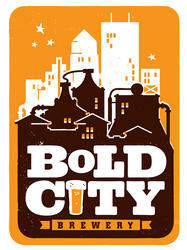 Watch for Bold City beer in cans to hit store shelves beginning Tuesday, June 25. A lot can happen in two years; relationships end and begin, friends come and go, the nation survives another election cycle, and Intuition Ale Works continues to produce top-quality craft brews. This week, Jacksonville’s second true craft beer brewery celebrates its second anniversary of brewing beers that are not only beloved by legions of local beer-lovers, but are also innovative and boundary stretching. During the past year the brewery, located in the King Street Beer District, has undertaken a number of new initiatives including becoming the first Florida brewery to can their brews and initiating a search for a second brewery location. The canned beer became an immediate success with demand sky-rocketing which in turn necessitated the search for a second facility. Several high-profile locations have been considered for the second brewery such as the Hayden Burns Library downtown and a riverfront plot in the old Shipyards area, but nothing has panned out yet. But, the search goes on and owner Ben Davis is hopeful that a new site will be found so that the brewery can expand and meet demand. This week, however, the theme is one of celebration. The brewery is pulling out all the stops to make this year’s anniversary a memorable one with new brews being released every day, special events, dinners, and seminars, and a blow-out bash on Saturday. In addition, the first 100 to request a Beer Passport and drink a 7-ounce pour of all 20 of the beers on tap this week at Intuition will receive a free growler fill and be entered to win a $100 bar tab. Monday, Nov. 12: Beer dinner with pairings from local breweries including Intuition and others at Royal Palms Wine & Tapas restaurant in Atlantic Beach. Tickets for the dinner are $60 and include taxes and gratuity. For more information and reservations go to: Beer Dinners. Tuesday, Nov. 13: The first of the week’s anniversary brews is tapped and Beer Passports are handed out. Also, in the Brewery Bar, Pecha Kucha, a sort of timed presentation synched with PowerPoint slides will take place. Intuition Owner Ben Davis will participate as one of the presenters. Wednesday, Nov. 14: Davis will host an informative seminar and beer tasting to explain to beer-lovers how beer is made, the process and artistry involved, and how the final product should taste. Tickets must be obtained for the seminar and are cost $15 ($10 for Mug Club members). The seminar includes tastings of ten different beers and snacks. 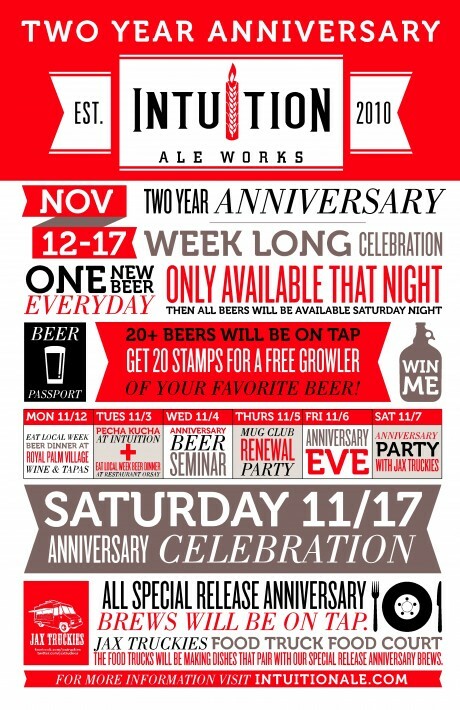 Purchase tickets from http://intuitionanniversarybeerseminar.eventbrite.com/. Intuition brews will also be served at Gas Full Service Restaurant’s beer dinners in St. Augustine. For more information and reservations go to: Beer Dinners. Thursday, Nov. 15: Beginning at 6:00 p.m. the brewery will hold its annual Mug Club Member Appreciation Party. This event is open to Mug Club members only. You can also get Intuition beers paired with culinary art works at Pele’s Wood Fire Drink Like a Local Beer Dinner. For more information and reservations go to: Beer Dinners. Friday: Nov. 16: Billed as Anniversary Eve, the fourth anniversary brew will be tapped. Think of this night as the warm up to the big event on Saturday. Saturday, Nov. 17: The Second Anniversary celebration begins at 1:00 p.m. with all of the special brews on tap and a food court of food trucks. In attendance will be Corner Taco, Mother Fletchers, Driftwood BBQ, and Dig Foods. In addition expect there to be plenty of good beer, fun, and good friends. Congratulations to the entire crew at Intuition, may you have many more years of prosperity and great beer!